Japan has the biggest tumulus in the world. You may say “Are you kidding?” No, it is true. Dear Egyptians, don’t get me wrong. The ancient Egyptian civilization, bringing the Great Pyramids into existence, had great technique, for example, the haul and quarry of huge stones. Ancient Egyptians finally heaped up those stones to the world’s highest. The civil engineering technology in ancient times has been the wonder of human history. Well, what part of the Japanese tumuli is the biggest? The answer is the largeness. At the tumulus of the Image 1, named Daisenryo-kofun Tumulus located in Osaka (A link to the location), the maximum length is 840 m (Approx. 2,755-feet) and the maximum width is 654 m (Approx. 2,116-feet). It affords enough space for 12 Yankee Stadiums. On the other hand, the Khufu’s Great Pyramid, made of all stones, stands 146 meters tall. To the contrary, the height of Daisenryo-kofun Tumulus, made of earth except the stone- built burial chamber and surface, is only 35 m (Approx. 115-feet). It is a huge different, of course (lol). However, when the tumulus was built, the surface was all covered with stones and clay figures, or “haniwa”, were lined up. It had its own beauty. From now, explore the Japanese tumuli. Don’t be afraid and let’s go! Watch the biggest tumulus from a drone! The tumulus seems a small hill from a level ground. From the 3rd to the 7th century, in Japan, numerous burial mounds were built, small and large, when emperors or local powerful clans died. It is called “the Tumulus Period”. According to one estimate, tumuli built in the period outnumber 150,000. As the years have passed, most of them seem wooded hills. Therefore, people did not often recognize the hills were ancient burial mounds when archeology was not advanced. The biggest Daisenryo-kofun Tumulus above mentioned is said to have been built in the early 5th century. The person buried there is presumed to be the 16th emperor, Nintoku, but there is scant evidence. The ancient Egyptian civilization had original hieroglyphs. For this reason, we can obtain detailed information on the history at that time. On the other hand, the evidence that characters appeared in Japanese history is date back to the late 5th century. The large keyhole-shaped tumuli are ubiquitous in Japan. The shape is said to have been unique to the Imperial Family. Building the same shaped tumuli by local powerful clans showed the proof of their loyalty to emperors. Do you enter the inside? Sorry. This is the presumed tumulus of the Imperial Family’s ancestor and is now off-limits. The Image 3 is the worship place. Here has been preserved as a sanctuary. Now, Explore the Inside of Another Tumulus! You can freely visit and enter tumuli except those which are presumed ancient emperors’ tombs or have the possible collapse of the inside. Now, let’s tour a common tumulus constructed in the late 6th century in Okayama Prefecture (A link to the location). First, you see the entrance of the Image 4. At night here would be suitable to courage test. The inside is in complete darkness. Don’t worry. You will be never haunted by any ghosts. The dromos surrounded by stones tell us that even a small-scaled tumulus required difficult construction work for ancient people. Tumuli have two types, shaft-grave style and horizontal-stone-chamber style. In the former tumulus, only one person can be buried. To the contrary, in the latter, additional burials are possible. But then, the construction of the latter types seemed difficult during the Early Kofun Period. They became popular since the Mid-Kofun Period. At last we arrive at a burial chamber where a stone coffin is placed. However, it is unfortunate that no remains and burial goods are left by grave robbing. If the ancient tumulus had not been robbed, what would be found? In all ages and cultures, there is a plenty of tomb looters. It is because funerary goods are very gorgeous and precious regardless of ages. They must be perfect targets. Japanese tumuli are no exception. Moreover, when tumuli were constructed, richly colored murals must have been painted. However, the humidity is high in Japan and murals leave no traces. Surprisingly, when a tumulus in the late 7th century was excavated, a beautiful mural depicting the ladies of the court (The Image 8) was discovered. This is extremely unusual in Japan. Since the ancient times, the three Imperial Regalia, consisting of a mirror, sword and comma-shaped bead, or “magatama”, has been passed down to Japanese emperors. The Image 9 is an imagined replica and only emperors can see the genuine one which is treasured in the Imperial Palace. The three types of items are thought to have been used at any rituals in ancient times. A number of funerary goods related to rituals are excavated in tumuli during the early kofun period. However, the accurate purposes of the use such as mirrors or magatama are unclear. According to one explanation, the comma-shaped beads symbolize fangs or fetuses. At any rate, the beads made of crystal or agate must have been priceless items for ancient people. Today, a Japanese emperor and Imperial family members have rituals as traditional events in the Palace. Bronze mirrors and magatama symbolized the religious power of emperors or local powerful clans during the early kofun period. The word of history is translated into the record of the changes in human society. 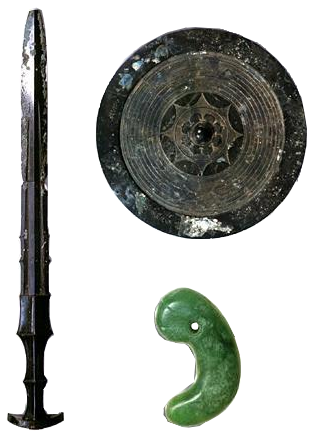 Funerary goods at the late Kofun period are eloquent of my opinion. Ritual goods were replaced by weapons at the time. Excavated articles like swords or horse clay figures tell us the historical shift. In the late 5th century, the range of jurisdiction or influence by the Yamato dynasty (the ancestors of today’s Imperial Family), located Nara Prefecture, spread even further. The evidence is the two tumuli, one (A link to the location) in the Kumamoto Prefecture, in western Japan, and another (A link to the location) in the Saitama Prefecture, in eastern Japan. The two swords, inscribed with the same emperor’s name, are excavated respectively (The Image 13). The dynasty emerged as the centralized government with religious authority and military might. The dark insides of tumuli deserve the treasure houses by which we can decipher the ancient history. In the late kofun period, the people of relatively low class, for example village chiefs, constructed uncountable small-scale tumuli on mountain slopes. Funerary goods are completely changed. Daily necessities like clay pots appeared. Ancient Japanese people became deeply absorbed in building tumuli over 400 years. In the course of time, large-scale tumuli were never constructed and tumuli themselves disappeared from the memories of Japanese people. Restored tumulus covered with stones. The tumulus was constructed about 1,600 years ago. The person buried is thought to be a head of a local powerful clan, but the long stream of time has made his or her name obscure. Most tumuli are indistinguishable from non-descript wooded hills. On the other hand Goshikizuka Kofun (A kink to the location) located in a famous port town, Kobe City is restored to the original state for sightseers. Stones cover the surface of the tumulus and the edges are lined with clay figures, “haniwa” (The Image 2). The administrative office gives you free admittance and a guide leaflet. From the top, you have a command a view of Seto-Indand Sea and Awajishma Island. Moreover, in vicinity to the tomb, the huge bridge, with the total length of 3,911 meters (Approx. 21,831-feet), spans the Akashi Straits. The two big-scale and man-made structures are illuminated at night. The scenery seems the evidence that human beings have lived their lives and had great ambitions since remote ancient times.